Obama To U.S. Women's Soccer Team: 'Playing Like A Girl Means You're A Badass' : The Two-Way When the World Cup champions visited the White House, Obama praised the team for changing stereotypes of women and girls in sports, and for inspiring "millions of boys to look at girls differently." 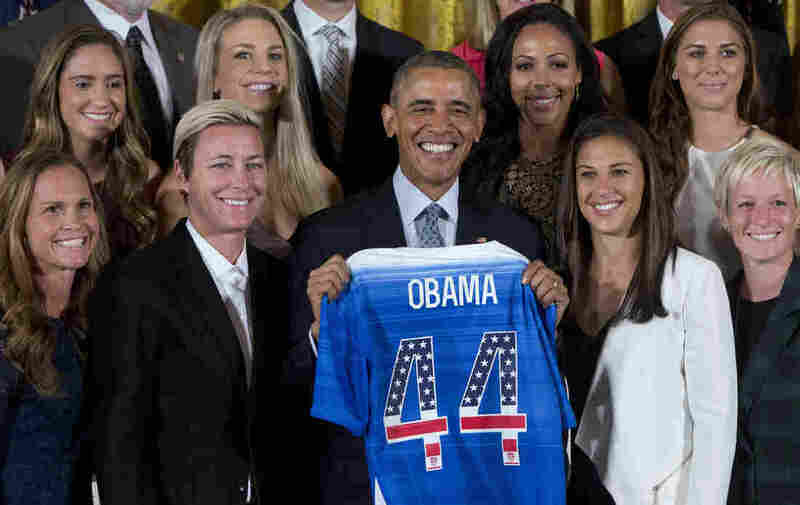 President Obama poses with a jersey he received from the U.S. Women's National Soccer Team during a ceremony to honor the team and their victory in the 2015 FIFA Women's World Cup. Standing with Obama are (from left) Christie Rampone, Morgan Brian, Abby Wambach, Julie Johnston, Sydney Leroux, Carli Lloyd, Alex Morgan, and Megan Rapinoe. The World Cup-winning U.S. women's national soccer team was honored at the White House today, where Obama praised the champions. "This team taught all of America's children that 'playing like a girl' means you're a badass," he said. The U.S. team beat Japan to win the 2015 FIFA World Cup in July, shattering TV ratings for soccer in U.S. the process. Since the victory, players have been on a victory tour that includes talk show appearances, interviews and exhibition games. During the team's visit to the White House, Obama spoke for about 11 minutes about the team's accomplishments and the contributions of individual players, including midfielder Carli Lloyd, who scored a hat trick in the World Cup final. "And Carli's performance was so good that by the time the game was over, someone had changed her title on Wikipedia from 'midfielder' to 'president of the United States.' Which, by the way, the job is about to open up," Obama said. He added, "I guarantee you Carli knows more about being president than some of the folks who are running. But that's a whole other — that's a whole other topic of conversation." Obama's remarks were mostly lighthearted — he teased striker Sydney Leroux about her Chihuahua, which has 10,000 Twitter followers, and mentioned that a farmer in California had built a corn maze in the shape of Megan Rapinoe's face — but he also struck a reflective tone about what the World Cup victory symbolized beyond the world of soccer, highlighting veteran Abby Wambach's "fairytale" ending to her final World Cup appearance. "I'm not sure [Abby] could have written a better ending: a world champion at last, draped in the Stars and Stripes, showing us all how far we've come -– on and off the field –- by sharing a celebratory kiss with her wife." Lastly, Obama praised the team for changing stereotypes of women and girls in sports, saying, "They've inspired millions of girls to dream bigger, and by the way, inspired millions of boys to look at girls differently, which is just as important." "Playing like a girl means being the best," the president said at the end of his speech. "That's what American women do. That's what American girls do. That's why we celebrate this team. They've done it with class. They've done it with the right way. They've done it with excitement. They've done with style. We are very, very proud of them."